The Green Belt as we now know it started on 3rd August 1955 with a Circular from the Ministry of Housing and Local Government calling on Planning Authorities to establish Green Belts. 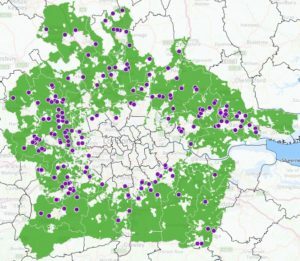 Green Belts have been one of the most enduringly successful and popular elements of the post-World War 2 planning reforms. They have helped to maintain a clear distinction between town and country which can be lacking in some other parts of the world. In 1988 the Principles of the Green Belt were incorporated in Planning Policy Guidance Note No. 2 (PPG2) issued by the Government. PPG2 has now been superseded by the National Planning Policy Framework and it is a credit to the drafters of the 1955 circular that so much of their work can still be seen as the basis of the NPPF. Scroll through the timeline below or find out more here.